﻿Last year, I did a review of the Sensible Portions apple straws, potato straws, and all of the other straws. This time, I was sent some of the pita bites and the miner's gold. The company aims at providing the highest quality ingredients without sacrificing flavor. 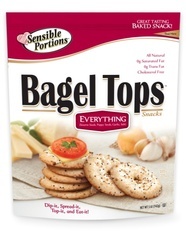 The company is also coming out with Bagel Tops too which I can't wait to try! Of the products that I was sent, my favorite is definitely the pita bites. They tasted very good on their own and even better when dipped in my homemade hummus. My husband really liked them too. I am also a big fan of the miner's gold which tastes a lot like white cheddar popcorn. One of my favorite parts about it is that you get a huge portion for only 130 calories. I took this for lunch and it made a great afternoon snack. To be honest, I am not the biggest fan of the apple straws or the potato straws that I was sent. They have a good flavor but are not very satisfying. I would definitely buy the pita bites and the bagel tops though when I see them in stores! I LOVE the Veggie Straws. Haven't tried anything else by them yet, but am addicted to those! This is ruining my Sunday diet..lol. Great blog, I feel a run to the food store coming. I love your blog! I'm going to make it a favorite to visit. I finally got myself on the healthy track and I can use all the help I can get! Following you back from blog hop. My husband and I are trying to be healthier so this will be a great resource. Thanks! Thanks for stopping by Newlyweds on a Budget! I absolutely love the pita bites they have! And they aren't super high in calories so I felt like I could justify them on my LGN (look good naked) diet for my recent wedding! They must be delicious. Greetings.